It has been a week since the UK voted in favour of leaving the EU. I understand that this has created some uncertainty for everyone working across the Life Science sector. I wanted to take this opportunity to say that this decision does not change our position as a world-leading cluster for life sciences research and development. We continue to have outstanding research centres, a rich research ecosystem, globally recognised universities and hospitals and access to fantastic talent. At this time nothing will officially change in terms of our relationship with the EU. The MedCity team are committed to continue promoting and growing the excellence of our region, our expertise and maintaining our vibrant community. London and the greater south east is still very much open for business and we will continue to champion and encourage life sciences investment, entrepreneurship and industry. For those of you who haven’t seen it already, the Mayor of London has released a statement which can be found here. MedCity joined the Precision Medicine Catapult, our colleagues from the NHSA and UKTI at BIO in San Francisco (6th – 9th June). We were also joined by 14 companies that are members of the Mayor’s International Business Programme (follow the programme on twitter @GotoGrow_London). MedCity is a strategic partner on the delivery of the programme and we really enjoy working with the companies on international delegations. If you are interested in seeing who is participating in the life sciences cohort you can see the full list of companies (not just those that visited BIO) on the Go to Grow website. I already know that many of the companies generated new business and new relationships and we will be working with the programme to chart the success of the mission. MedCity spent some of its time promoting DigitalHealth.London – Sarah presented on DH.L’s work and on MedCity at One Nucleus’s business breakfast on the first full day of the conference. The rest of our time was spent meeting a wide range of companies and contacts from across the globe, with a focus on Cell and Gene Therapy, Digital Health and discussing our recent report Planning for Growth – Demand for Healthcare R&D Space in London. As part of London Tech Week, MedCity and TechLondonAdvocates invited panels from the NHS, Corporates and Entrepreneurs to give an innovative and engaging perspective on what it takes to work successfully with the NHS. A practical and insightful event, which the audience, of mostly innovators, found refreshing and thought-provoking. Highlights included ways in which the NHS is changing to engage more with innovators, such as advent of the NHS Innovation Accelerator, Vanguards and funding streams. The NHS panel also gave some insight into how to approach the NHS and what they are looking for. The panel of entrepreneurs gave some top tips that have worked for them in their path to innovation and working with the NHS and finally, the corporates and what they look for in collaborating with SMEs. Sense Biodetection Limited (Sense) has announced that after pitching at the ‘Angels in MedCity’ event in November 2015, it now has completed a £508,000 oversubscribed seed investment round. The investment will allow Sense to continue to establish its technology portfolio and support the further development and clinical evaluation of its first products. C2N is an exciting project in the broad life sciences domain which launched in 2016, part-funded by the European Regional Development Fund. MedCity, in collaboration with KCL, UCL, Imperial, and QMUL, will be holding the SME Launch Event of the Collaborate to Innovate (C2N) Programme on the 28th of September. The event will provide more information about the scheme and how to get involved, and will feature examples of collaborations from the project’s academic partners. There will be opportunities for networking and for one-to-one meetings with academics. The event is open for UK SMEs. I was a little surprised, but nonetheless pleased, to be invited to speak at a book launch last week. This is not an everyday occurrence. Of course, having said yes, this meant that I had to read the book and I returned from BIO, somewhat jetlagged, to find a parcel waiting on my desk. 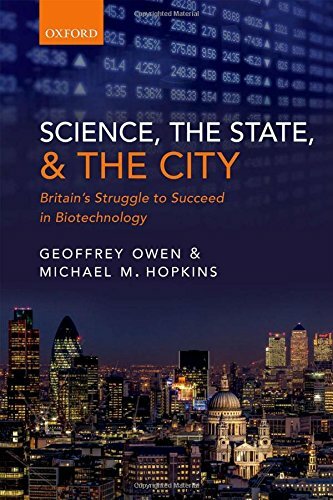 Science, The State & The City has been written by Geoffrey Owen, a former journalist and senior fellow at the London School of Economics and by Michael M Hopkins, who is a senior lecturer and Director of Research for the Science Policy Research Unit at the University of Sussex. I have to confess that this is not the kind of book that I generally read in my spare time, but equally I recognised that I wouldn’t have much to say unless I actually read it. The book is subtitled Britain’s Struggle to Succeed in Biotechnology, but I would say that a better title would be ‘everything you ever needed to know about the history of biotech in the US and the UK and story of how it was financed’. Now, if my suggestion doesn’t shout page-turner at you, I would ask you to reconsider. This book is a fantastic read and I can assure you that MedCity is not receiving a commission for every book sold. Some may know that I spent part of my career within the UK civil service, where I head up the BIS (then DTI) Bioscience Unit, now part of the Office for Life Sciences. I would have been an infinitely better policy maker if I had had this book at that time (had it existed). I reckon that it would have reduced the time it took me to get settled into the job by at least two thirds, without any exaggeration. The book charts the emergence of biotech in the US and goes some way to explain why the US gained such success through first mover advantage. It goes on to consider the industrial history of biotech within the UK and compares the approach and policy environment to a number of other countries. It takes you through the authors’ analysis at pace and the writing is engaging and pithy. If you are interested in finding out more about this book, use this link – it will also link you through so that you can order the book from OUP with a 30% discount. The South East Health Technologies Alliance (SEHTA), a not for profit health network support organisation is working with MedCity through funding from the GLA to help understand and meet the needs of London-based small medtech and diagnostics companies. As part of this programme, the partnership will be conducting a “How to Access the NHS” Workshop taking place on Tuesday 19th July at City Hall, London, supported by Kent Surrey Sussex Academic Health Science Network (KSS AHSN). As a follow on to this workshop, KSS AHSN and SEHTA supported by the GLA in partnership with MedCity, DigitalHealth.London and Enteric HTC will also be holding two London Innovation Surgeries at Queen Mary University, Whitechapel Campus on 26th & 28th September. The FT Digital Health Summit Europe returned to London this year and brought delegates a top-level speaker roster and agenda. Formulated to give attendees the latest insights into the the most pressing issues to date – putting the patient first, cyber security threats in healthcare and interoperability in existing IT infrastructures. The CEO of MedCity, Sarah Haywood participated in a Digital health dialogue: Addressing the challenge of interoperability. The head of NHS England has announced the launch of a new programme to fast-track cutting-edge innovations from across the globe to the NHS frontline. In his keynote speech to around 1,000 NHS leaders at the NHS Confederation Conference in Manchester, Simon Stevens will announce that for the first time the NHS will provide an explicit national reimbursement route for new medtech innovations. This will accelerate uptake of new medtech devices and apps for patients with diabetes, heart conditions, asthma, sleep disorders, and other chronic health conditions, and many other areas such as infertility and pregnancy, obesity reduction and weight management, and common mental health disorders. ABHI is leading a mission to Texas from 15 – 21 October 2016 in partnership with leading AHSN’s, FCO and UKTI. The mission will provide Medtech companies with unprecedented access to KOL’s and senior leadership teams in world class hospital systems across the state. ABHI has been developing an industry strategy for the US market, which uses Texas as a soft landing. The mission in October builds on a recent highly successful visit, which saw companies benefit from engagement with hospitals, the US Military, and professional business support organisations. The mission in October will again offer the opportunity to connect with a variety of health, academic, technology, buying and business organisations at the highest levels. it has the second largest GDP of any US State at 1.7 trillion dollars and were it a sovereign country, it would be ranked as the 12th largest economy in the world by GDP. Texas has the highest proportion of hospitals of any State in the US. Texas is ranked 3rd in the US on overall healthcare expenditure beating the city of London or even countries like Portugal. Texas is the 7th largest health economy in the world and has significant ambition to be a Global Healthcare and Lifesciences player over the next decade. MedCity was established in April 2014 by the Mayor of London with the Higher Education Funding Council for England and the capital’s three Academic Health Science Centres – Imperial College Academic Health Centre, King’s Health Partners and UCL Partners. The next edition of MedCity Update will be sent in July. Copyright © 2016 MedCity. All rights reserved.